The book is to be praised for the clarity and synthesis with which it untangles the multifaceted background of Godfrey’s life and career in the West. In the first chapter we find a discussion of Godfrey’s ancestry on both the maternal and paternal side, and their role within the politics of the Holy Roman Empire. John weaves an interesting picture of the dukes of Lotharingia that preceded Godfrey, clearly laying out the alternating fortunes of an ambitious dynasty that played on the European theatres from Germany to Italy. Particularly striking is his outline of Godfrey the Hunchback, Godfrey’s uncle, an intriguing figure and a powerful warrior, from whom Godfrey inherited the title. The family’s well-connected, varied interests and the shifting grounds of imperial-papal relations are thoroughly explored here to lay the foundations for the biography to come. The second chapter deals with Godfrey’s career in the West, a theme complicated by the paucity of sources. John paints a convincing picture of Godfrey as a ruler at the moment of the waning power of the German dukes, who spent his first ten years entangled in succession disputes attempting to shore up his power. A discussion is dedicated to what we can glean of Godfrey’s position and policies from the scant evidence, with his lacklustre career showing a drastically reduced range of interests and influence from those of his ancestors. This discussion is necessary to introduce and ground the theme of chapter 3: the coming of the crusade and Godfrey’s decision to take part in it. Having persuasively shown Godfrey as a man hampered and limited in his home theatre, John makes a powerful case for the reasons that pushed Godfrey to an enthusiastic preparation for the crusade, with the very probable intention of not coming back from it. Godfrey is shown undertaking the difficult task of raising enough funding for the expedition, shutting down religious houses he had patronised to recoup the money, selling his own castle, and minting coins celebrating him as a pilgrim to Jerusalem. John thus shapes a rounded and well-rooted portrayal of Godfrey as he was to embark on the final and best-publicised phase of his career, which lends additional shading to chapter 4, dealing with Godfrey on the crusade. This is the chapter least likely to yield surprises for readers already familiar with the crusader canon, as the writer is perforce re-examining well-trodden ground. Here too, however, John remains close to the lesser-studied aspects of Godfrey’s crusade, making an in-depth discussion of his possible involvement with the persecution of Jews on his way East, and re-interpreting his rise to the head of the crusader forces in light of his earlier career and interests. While I wish deeper analysis had been made of the literary and narrative side of Godfrey’s presentation in the crusader sources, John’s examination of them is painstaking and in-depth, and his coherent analysis of Albert of Aachen as a writer close to the Lotharingian perspective is particularly engaging here. John is keen to underline the contingent and tangential aspect of Godfrey’s rise within the crusader ranks, showing how Bohemond’s abandonment of the march to Jerusalem and Raymond of Toulouse’s failure to understand the popular mood within the crusader ranks excluded them from leading the expedition. John’s interpretation of Godfrey’s career as ruler takes the novel and interesting angle of Godfrey as popular leader: much attention is dedicated to the prevailing mood among the crusaders, with religious fervour and even millenarian tendencies reinforcing a longing for the Holy City which Godfrey alone managed to coax and turn to his own advantage. The writer also outlines the shifting alliances within the crusader forces, showing how the changing allegiance of Robert of Normandy and Tancred seem to have marked the moment in which Godfrey rose to prominence. Chapter 5 deals with the aftermath of the conquest of Jerusalem: while the uncertain legal status of Godfrey’s reign in the east, with the title of neither king nor defensor, has often been treated in crusader scholarship, John’s discussion is necessary here and it is framed by both the ongoing analysis of Godfrey’s policies and an in-depth discussion of his succession by his brother Baldwin. John also underlines and deepens the understanding of Godfrey’s policies in shoring up the newly conquered dominion, conciliating the difficulty of granting land in a mostly unconquered theatre with the necessity of ensuring the loyalty of his men and attracting more crusaders to Jerusalem once the first wave of pilgrims had begun to depart home. The writer correctly points out that, while Godfrey’s prowess as warrior is constantly praised in the sources, it is not often described in depth, and this chapter presents his efforts in rebuilding a coherent picture from what information we have. The portrait achieved shows Godfrey as an efficient campaigner, unafraid of tackling his hostile Muslim neighbours, but also intent where possible on building successful alliances with them, and constantly supporting the other Latin rulers in the area. John concludes his discussion with the analysis of Godfrey’s final weeks and death of illness, and the embattled but ultimately successful succession of Baldwin, who turned Jerusalem and connected lands into a kingdom, thus changing and solidifying the rule he had inherited from his brother. An epilogue, then, charts Godfrey’s depiction in the historical and literary sources up to the early 14th century, with a catalogue of appearances in increasingly idealised light which eventually consolidated his position as one of the Nine Worthy warriors of literature. This concludes the examination of Godfrey’s life with a survey of the way his legacy was perceived in the two centuries after his death. 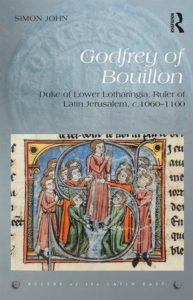 Omnipresent in the crusader sources but seldom studied in his career beyond the crusades, Godfrey of Bouillon was due for a new biographical examination. Through painstaking analysis of the sources, in-depth prosopographical work, and clear analysis of the political and military background, John has produced a thorough portrayal, which by rooting Godfrey in his context before the crusade deepens and roots our understanding of his career in service of the Latin conquest of Jerusalem.